Whilst in Hong Kong, the notebooks got a fair workout, trying to find a way to apply Picasso’s “The Bull” concept to my visit. Picasso started with a very detailed, and aesthetically pleasing sketch of a bull and stripped away parts of until he felt he had uncovered the essence of the subject. What is the essence of Hong Kong for me, and how could I capture it? What follows is an edited version of the content from my trip notebook. It will give an insight into how the thought process developed into a kinda semi-final idea. I started by building on a previous exploration. Please take it easy on the curating the following photos – they are strictly a fairly unedited first cut from my trip pulled out to help demonstrate my meandering thinking… And this is not supposed to be a comprehensive “lesson” on the deconstruction idea I am working on. I just wanted to share how my brain works! 1. Pick a single subject and shoot a roll every day, gradually decomposing what it is – bit by bit. Was it a physical object or could it be a “theme”? became a question that needed answering. For example, could the subject be different street “spruikers” or sales people? 2. Every day, at the completion of the day, think about the images captured throughout the day and contemplate if there were any potential subjects. Plan a follow up shoot for the following day based on this. 3. Every day select a single subject in advance (or on the fly as they revealed themselves throughout the day) and focus in on it. Shoot at least a roll with frequent breaks to stop and think more consciously about the subject. 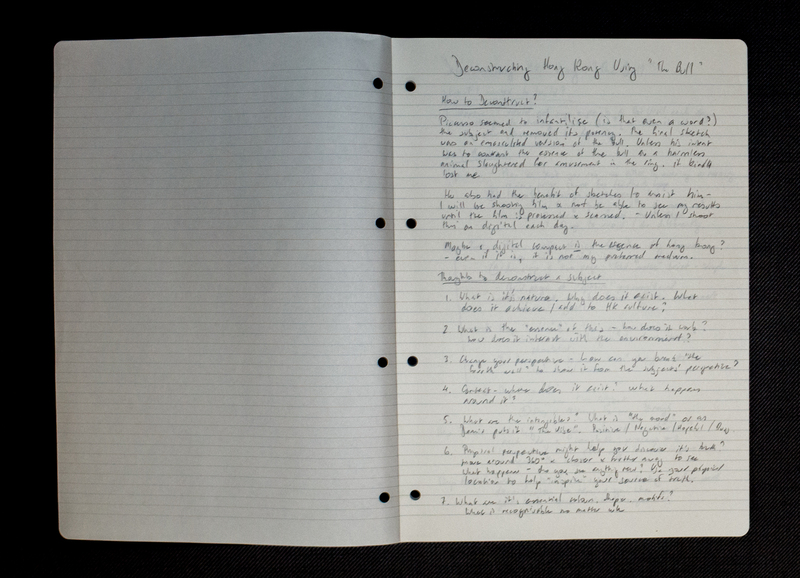 Each night, review the subject explored and shortlist for a “last day” detailed exploration. 4. Just “find it” each day, and pause to explore. He also had the benefit of sketches to assist him – shooting film removes the ability to instantaneously see the results until it is processed and scanned. Perhaps this is a digital project? 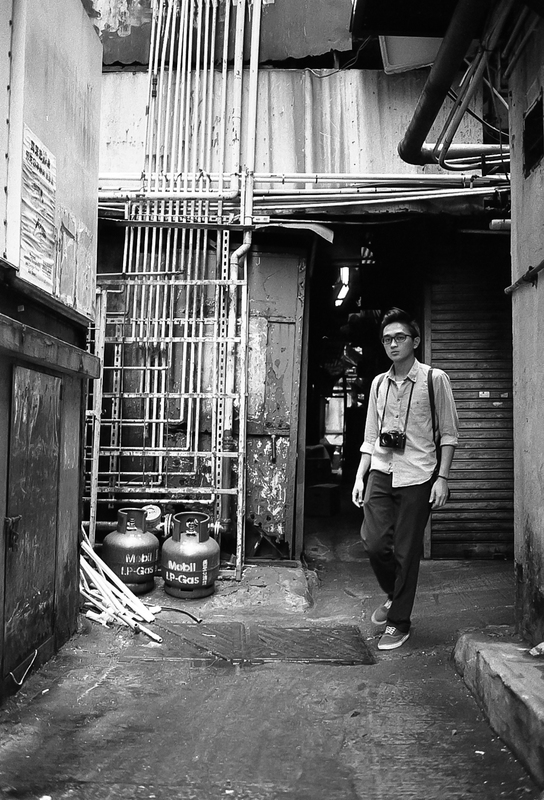 Maybe a digital compact is the right way to capture Hong Kong – even it is, it is not my preferred medium. 1. What is it’s nature. Why does it exist? What does it achieve / add to the local culture? 2. What is the “essence” of this answer – how does it work? How does it interact with the environment. 3. Change perspective – break through the “fourth wall” to show the subject from a unique and unusual perspective. 4. Context – where does it exist? What happens around it? 5. What are the intangibles? What is the “mood”? Positive, negative, hopeful, busy? 6. Physical perspective might help you discover it’s truth? Move around the full 360 degrees, move closer and further away to see how perspective changes. What happens? Do you see anything new or different now? Use physical location changes to help inspire and find a source of the subject’s “truth”. 7. What is it’s essential colour, shape, and motifs? What is recognisable about the subject, no matter how small a fragment? From this point, I developed a daily routine of considering and briefing a new potential subject each day. But I was stuck. I spent some more time thinking and writing in my notebook. Getting closer. Moving in closer to subjects was delivering more interesting images. Even though I couldn’t see the images yet (film was still in canisters!) I could see many of them in my imagination. On a number of occasions I could have literally reached out and touched them. Muting my inhibitions to get close was critical in getting the images I wanted so badly. Going down the path less travelled. I didn’t “find” my Hong Kong inspiration on this trip until I went down the back laneways and alleys that support the teeming life on the front streets. Near Dot-Well I spotted a guy with a film camera ducking down an alley and decided to follow him. I came across him finishing up a couple of shots of the alley. I realised then and there that I needed to get off the main streets to see something new and different about the place. I copied with pride to get me started again. Going back to the same places as previous visits was just delivering the same shots. It is like returning to a failed or forgotten friendship – it seems like a good idea, and initially there is some intimacy, but the source is based on the past and soon dries up. Unless you can create something new… See the same places in a new way? But I wasn’t – I was just taking the same shots I had taken on previous visits. I needed a fresh point of view. My time in Hong Kong was coming to an end, but I still hadn’t a single solid idea for a “bull” deconstruction. Some more open thinking was required on potential themes. What is different about Hong Kong? People making the most of busy and cramped spaces. 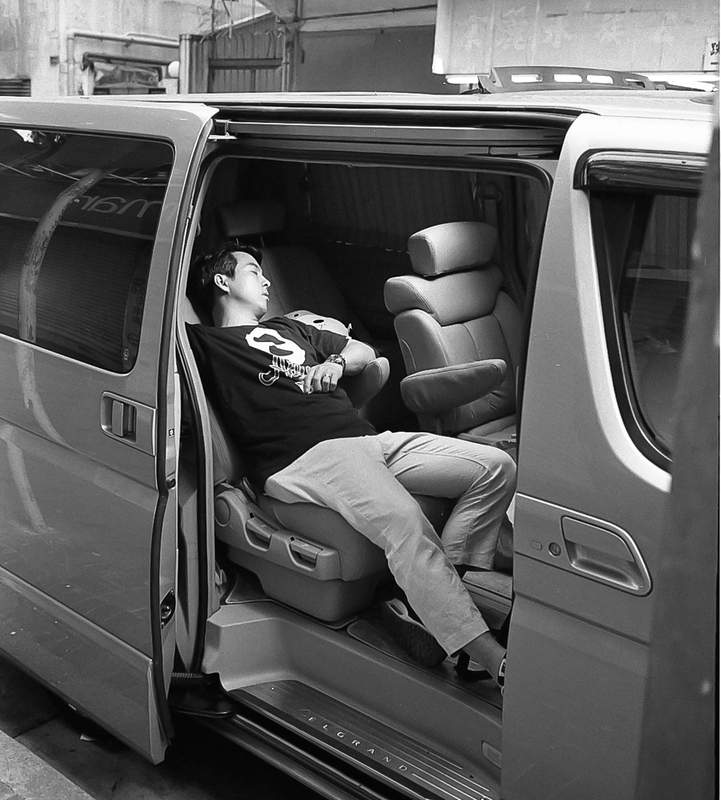 The hidden life on the laneways – “backstage”. “Finding Space” – in terms of all dimensions including time and space. Creating an Oasis – making space in the here and now, wherever, whenever. These building themes brought me closer to an idea. 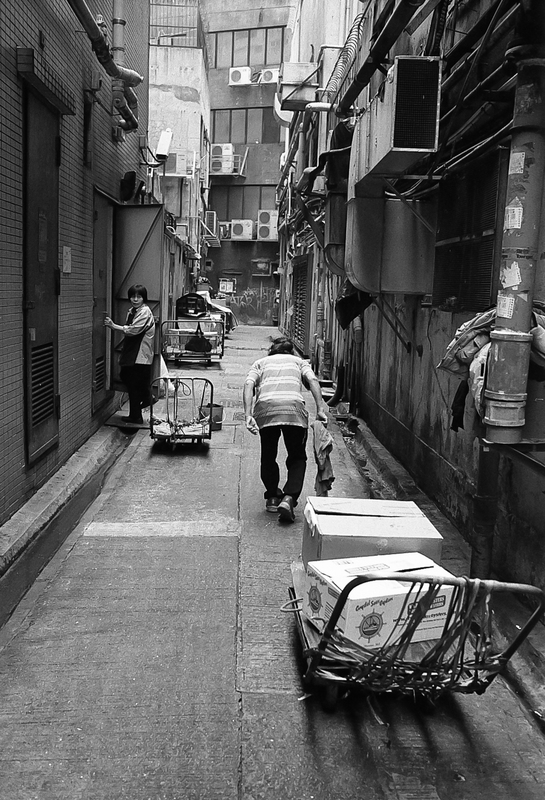 The laneways behind the shops and markets in the back alleys are the heartbeat of the Hong Kong. Even the shops in the tiny alleys have a “rear” spot where the owner can take a brief respite, or some dinner. Deconstructing the laneways could be a suitable subject for a “bull” project. But I had only discovered this idea in the last few days… The lanes are the minor, tiny arteries suppling the last drops of blood to the city – not as critical as the major arteries, but you know it if they stop working, little by little. What is the essence of the laneways? They are MY place (from the POV of the shop keepers and other service people), a private place where few people venture. Away from the masses of people, where I can take a moment. “I don’t have much, but I have this space”. Everything in Hong Kong is tight and crammed in. Everyone has to eke out a space wherever and whenever they can. People have to make do. Every place is crowded, so you have to find a way to create space both physically and mentally. I started to explore the laneways and small space theme, and a number of images got me thinking. 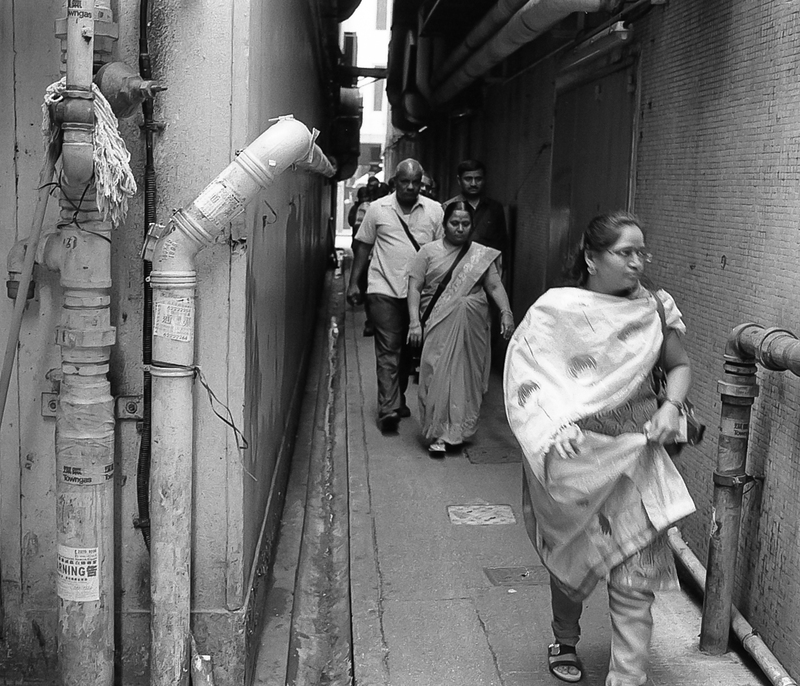 – The indian family walking down a random lane. Whilst I missed most of it as I was changing rolls, it was quite a “find”. 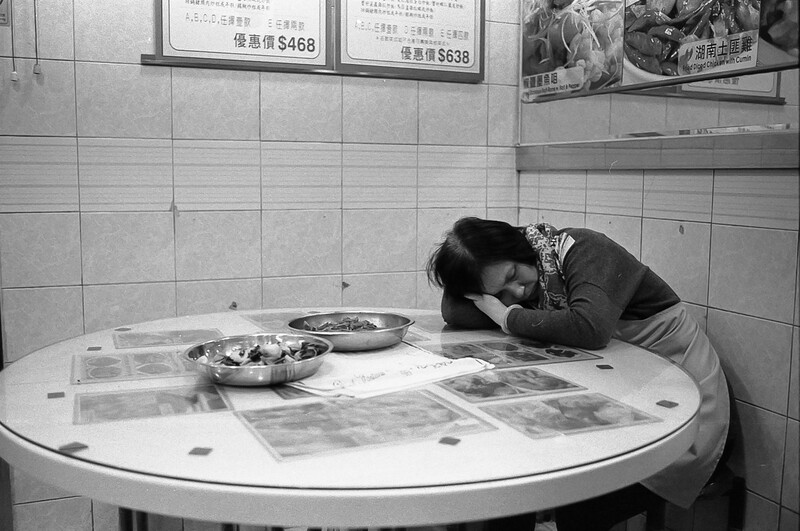 – The waitress asleep on a table where I would often drop in for dumplings. Although I like the first composition at the top of the post a bit better? Perhaps the brief is “finding space” and being OK with it? Show people living and working in tight spaces to contrast with the wide open spaces of Australia. Now, how to deconstruct it further! That is as far as I got before jetting back to Australia. At least I have a clear idea of what I would like to shoot next time I visit Hong Kong. I still managed to get some great images, and was able to shoot enough test shots to know the theme is a strong one for my next visit. The whole post has been a bit of a ramble, but I hope it has demonstrated some of the thinking process I go through when coming up with an idea for a theme, and how to build on an idea or inspiration from another creative person’s projects. You say that the post is a bit of a ramble, but in a way that is part of the point. You are thinking out loud and just writing it down helps to put it into context and order and that clarifies your thinking. I found this very helpful and it provides a good entré to a project that I want to try.